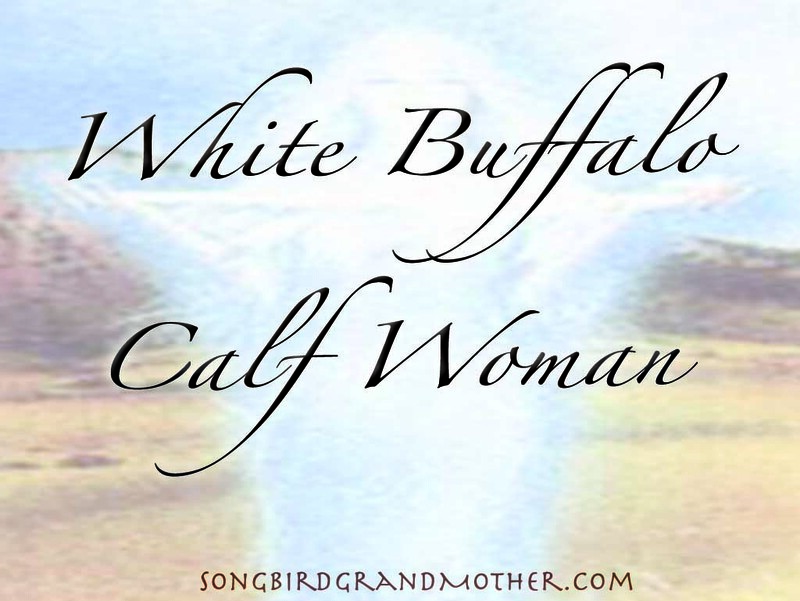 Who is White Buffalo Calf Woman? She is Our beloved Grand Mother, Mother, Grand Daughter, Daughter, Sister, and Wife–representing all the stages, processes, and love of the Mother. She is the epitome of what it means to be a woman on all levels, stages, and beauties. The path of the holy woman, the pure woman, the woman who masters all parts of womanhood. Her energy, vibration, love, and wisdom is within ALL wise woman. The true meaning of her story teaches the 7 stars of Pleiades and the Ancient Star Wisdom of Grand Mother. If you look up into the sky and are blessed to connect with Pleiades, then you will see Grand Mother White Buffalo Calf Woman shining her love into your heart. Guiding you to the place within you where the Divine Mother shines her love onto your path. She represents the initiations of womanhood and going through all the levels, transitions of woman-hood life-time after life-time, over and over again, to bring back the sacred peace pipe at this ascension gateway here on Turtle Island, Grand Mother Earth. Grand Mother White Buffalo Calf Woman reminds us to spread our voices to the wind, follow our visions out to the end, and never give up on the light within. To shed all the darkness in and around our lives, and join together to help one another create this rainbow bridge. The time to be of one-mind, one-heart, and one-love is now upon us. As her time of humanity is now coming in strong bridging us back to the ancient ways, bridging the time of the rainbow, and the joining of all races, creeds, dimensions, and ancient wisdoms it is time to AWAKEN to her power. The time of the wisdom keeper is now upon us, many are called to remember their calling, and walk with Grand Mother White Buffalo Calf Woman to bridge the time of peace for the next generation. As the youngest Sister of all the Grand Mother’s, White Buffalo Calf Woman reminds us to remember the youth. The young women, the grand daughters, daughters, and young mothers. Too often we push the young away, dis-honor their truth, and dis-miss the wisdom they hold. Grand Mother White Buffalo Calf Woman reminds us to honor the youth, to help them to follow their heart, and show them the way of WOMANHOOD with respect and honor. To teach them to own and hold their power–by owning and speaking our truth and power. It’s time to step up as the Wisdom Keepers and Mentors for the next wave of Wise Women emerging onto their path. For everyone reading this, there is a deep calling from Grand Mother White Buffalo Calf Woman to RISE INTO YOUR POWER. To honor your gifts and services, and to SHARE ALL OF THEM. Don’t hold back. Shine YOUR LIGHT, like never before. Her love is blessing you, and asking you to trust that GREAT BLESSINGS are now aligning for you in your life. Trust your Grand Mother, White Buffalo Calf Woman, for she is here to guide you, honor you, and help you on your Earth Walk.